Following on from Chris Chilton’s passenger ride back in March 2018, we finally get behind the wheel of Ford’s new Fiesta ST. It’s been so hotly anticipated because the outgoing ST was one of our favourite hatches of all time, and we’ve been itching to find out if the Ford engineers have ruined it in the name of improving refinement, or if its plucky attitude has survived. Well, the good news is that in terms of character and feel, the new car is brilliantly familiar, while the outer envelope of its abilities has been further stretched with the inclusion of some trick suspension and the option of a limited slip diff. If you loved the old ST, you’ll love the new one even more. We've now driven the new Ford Fiesta ST with, and without, the Performance Pack. Click here to read more about the regular Fiesta ST without the PP. Before we race ahead, can we have a bit of ST history? The ST badge was first used on a Fiesta in 2004 for a mildly warmed version of the sixth generation car. It was powered by a 150bhp 2.0-litre engine and while it had some nice stripes it was largely forgettable. Then in 2012 a new ST was announced, based on the Mk 7 Fiesta, powered by a 1.6 turbo engine that put out 178bhp with an ‘overboost’ function that could deliver 197bhp in short bursts. No-one had particularly high expectations of this car until we drove it: it proved to be ‘an absolute blast,’ as we said in our five-star review in 2013 – a car to ‘plaster a smile all over your face’. Towards the end of its lifecycle Ford raised the bar again with the ST200, which offered 197bhp and something like 230bhp on overboost. It too got rave reviews, and it’s this car that the 2018 ST has to beat. Isn’t that going to be tricky with a 1.5-litre three-cylinder engine? It’s true, the big headline change in the new Fiesta ST is the switch from the 1.6-litre four-cylinder to a 1.5 triple, but this brand new engine is based on Ford’s award winning 1.0-litre Ecoboost, a work of internal-combustion magic. The new ST’s power unit is fruity, fizzy and full of personality, and somehow – out of just three cylinders – Ford has extracted a remarkable 200bhp and 214lb ft from it. There is no overboost this time, so that is peak power, but given this remains a little lightweight hatchback (the 3-door’s kerb weight is just 1262kg) that is more than enough power to make the ST a rapid car: Ford suggests 0-62mph time is 6.5 seconds, marginally down on the ST200 (6.7 seconds). Top speed is 144mph. Best of all it revs so willingly and makes a better noise than the old engine. Ford has also introduced cylinder cut-off – a first for a triple – so when you’re cruising with revs below 4500rpm, the engine becomes a 1.0-litre twin, improving fuel efficiency by a claimed 6 per cent. I don’t know whether I experienced a cylinder cut while out testing – if I did, it was seamless, though in truth I probably didn’t, because I had the throttle mashed to the floor the whole time. Is the Fiesta ST is still fun to drive? Absolutely. 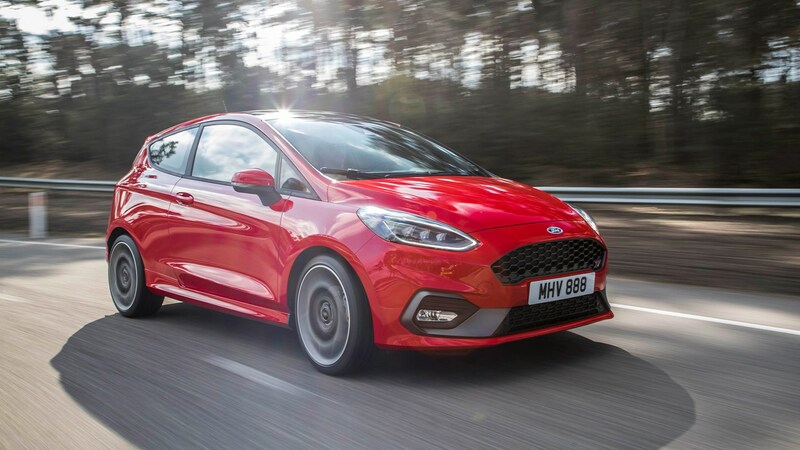 Ford has made all sorts of mechanical adjustments and improvements over the outgoing model: the ST’s track is 10mm wider than a standard new Fiesta and 48mm wider than the old car; the steering ration is 14 per cent quicker than the ST200; and torsional stiffness is up 8 per cent. But importantly, it hasn’t lost sight of what made the ST so good to drive. It retains its slightly stiff but very direct steering, and the overwhelming 'just point it at a corner',' feeling. The Fiesta ST doesn’t feel loose or wayward, it always feels tight and under control, but there’s still a distinct feeling of playful adjustability in the rear axle. It makes the car feel alive and gives every corner a little dance of possible trajectories. And after you’ve barrelled your way into a corner and picked your line, the ST deploys its other, brand new weapon: a Quaife limited slip diff which comes as part of an optional, £850 ‘Performance Pack’. This, combined with the Michelin Pilot Super Sport tyres, provides an obscene amount of grip coming out of even the tightest back-road bend, allowing you to get back on the throttle ridiculously early. There is some torque steer, of course, but not enough to ruin the feeling that you can aim and squirt this car with precision. In terms of fixing flaws, the driving position is much better in this car – you can now pump a lever and lower yourself towards the floor, instead of feeling like you’re perched in a child’s highchair like the old one. However, the bone-jarring ride is only partially resolved. Ford talks a lot about the new ‘directionally wound force vector springs’ and ‘frequency selective dampers’, and there’s no denying this is clever, brilliantly sorted chassis – but let’s not kid ourselves. There’s still a lot of vertical jigglingly and bouncing going on, so much so that on an uneven back road, you have to concentrate just to get your finger in the right place on the touchscreen. It doesn’t sound like the ST has ‘matured' much? Actually, that’s the great thing about the new Fiesta ST, it has actually taken some big strides in terms of refinement. I like the new Fiesta family look, and the ST isn’t too bling – just a few red details and a honeycomb grille. It’s not an embarrassing car to drive. Inside the interior is a huge step forward, with a much modern modern ambience, and the latest digital screen tech. Altogether, it does feel like a more grown up car to own, without losing that ridiculous playfulness if you want to drive flat out. There are three equipment levels available: ST-1 starts at £18,995, which is the headline entry price that Ford wants to trumpet. 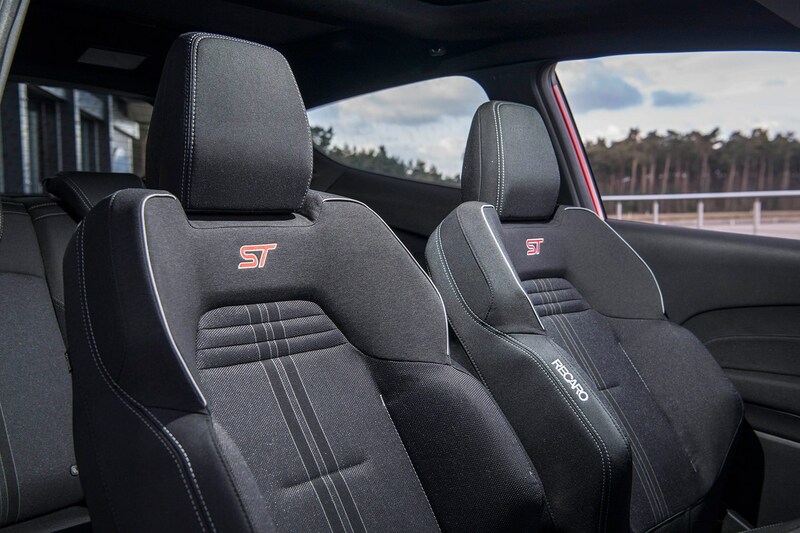 For that you get 17-inch wheels, the switchable drive modes, the Recaro seats, the flat-bottomed steering wheel; you’d be very happy with an ST-1. Then ST-2 gets you climate control, a bigger, 8-inch touchscreen and a fancier sound system for £19,995 (or £20,645 for the five door). Finally, the ST-3, the car we drove, brings the 18-inch wheels, the red calipers, sat-nav and various auto-wipers and mirrors. The three-door is £21,495 while the five-door starts at £22,145. The new Ford Fiesta ST combines all that was good about the outgoing ST200 with a much better interior and a suprisingly brilliant new engine. If you think the exterior has made the new version perhaps a touch less characterful, don’t worry – from the driver’s seat, it has as big a personality as ever. Ford Fiesta ST: do I need the Performance Pack? The above impressions of the Ford Fiesta ST aren’t based on the standard car. In fact, Ford sent us a higher-spec model with the £850 Performance Pack and this doesn’t drive in quite the same way as the feisty Fezza with no options boxes ticked. We have had a chance to sample the ST in both guises, though – back-to-back on the same roads in the mountains above Nice in France. And there’s a massive difference in the fun factor, make no mistake. What is the Performance Pack on a Fiesta ST? The Performance Pack comprises a trio of go-faster additions: a Quaife limited-slip differential on the front axle, a launch control system to torture the clutch and front tyres (track use only, kids…) and shift lights to tell you when you’re getting close to the redline in case you’ve got the stereo turned up too loud. But being perfectly honest, we only need a third of this combo to make the ST into the car our testers have fallen so deeply in love with. It’s that slippy diff, and how the Fiesta’s handling responds to it. When directly compared two things stuck out – first, the fact that the diff is extremely smooth in how it measures out its torque, far more so than that on a Corsa VXR’s Performance Pack, for example. This helps prevent the feeling that the steering wheel is constantly at odds with your intended course, tugging either way insistently. It’s a problem inherent in many front-drive hatchbacks, but Ford’s engineers have pulled off some magic here. There’s a slight nibble at the ‘wheel when you plant the throttle in a straight line, but if you’ve ever driven anything else of this ilk you’ll be amazed how nicely this ST’s set up. And mid bend you’ve got huge traction, of course, the diff doing the hard work and sending torque to either wheel according to the under-tyre adhesion. Driven without the LSD you’ll notice immediately it isn’t as adjustable on the throttle because the front end won’t bite in quite the same way, instead washing frustratingly wide. You can still get that twist-beam rear end to **** a wheel, but it’s more difficult and requires quite a lot more commitment. That brings us onto the next frustration with the cheapest STs – you’ll work those brakes incredibly hard because the traction and stability control have a lot more to do to keep that 1.5 three-pot’s performance under control. The diff mitigates this, though we still managed to get them rather ‘warm’ on both cars during our test. Rude not to, right? We could take or leave the shift lights and launch control, though. 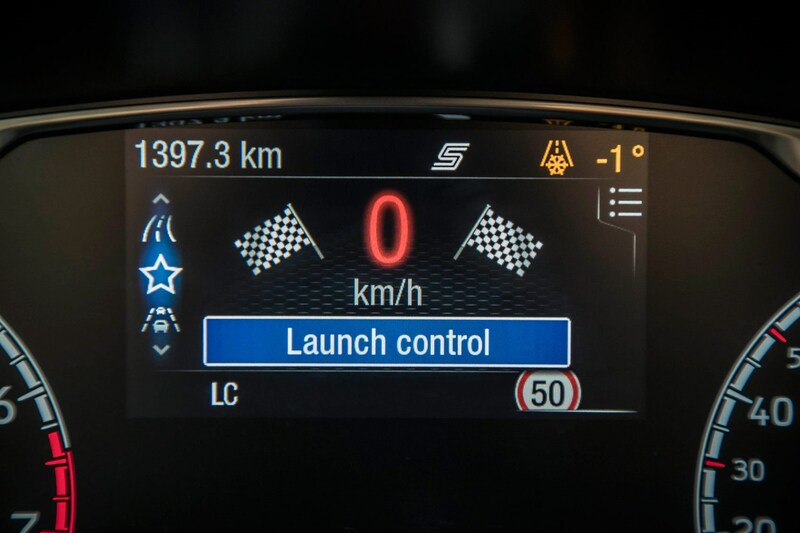 They both do things we’re prefer to be doing ourselves – a nailed upshift is a joy in the ST, with the associated pops and bangs from astern, and there’s a lot more skill involved in the optimum launch from a standstill unaided. Besides, launch control on a manual car offends this tester’s mechanical sensibilities. That poor transmission! I guess it's a good thing for me this new FiST isn't coming to the US, because really I don't need to buy another new car. Sweet little car - why no RWD on any hot hatch? Would think the first manufacturer to do that would steal the show. What's 3K lbs and RWD anymore? Nothing cheap. A used 86/FR-S/BRZ. But my guess is that stock for stock, this new Fiesta would likely outrun it on a backroad/canyon trip. Renault 5 Turbo from the mid 80s and Renault Clio V6 from the mid 2000s; these are the only 2 I remember. But, I'm sure there were others. Problem is, in the case of the RWD midship Clio V6, it was handily outhandled and outmatched by the cheaper FWD Megane RS of the same era (circa 2004). Boo Ford for not bringing this car to north America. I brought this up many years ago and was laughed out of the thread. now get out of this thread. ...then it will be, "Oh..haha! Funny man, want's to shift gears himself!" Totally disagree.... " what's wrong with you. You don't want your car driven by a bunch of sensors tied into a multi trillion dollar government computer." Last edited by Blitzkrieg; 05-20-2018 at 01:06 PM. Because there aren't any RWD economy cars to base them off of. Best-sounding hot hatch by far IMO. Shame it won't grace our shores. The Miata is only $25K. I've learned dealers don't advertise the really good deals. They went pretty quick here in the north east, I found about 20 within 100 miles of my address between $15,200-$17,300 when the deals were first out, 3 days later there was only 1 left.